With your love and a little bit of imagination, the Lalaloopsy magic can go on forever! With your love and a little bit of imagination, the Lalaloopsy magic can go on forever! ach doll has her own personality that comes from the fabric used to make her. 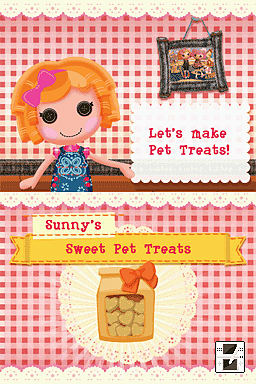 Join Mittens Fluff ‘N’ Stuff, Tippy Tumblelina, Crumbs Sugar Cookie and more in the magical Lalaloopsy Land! 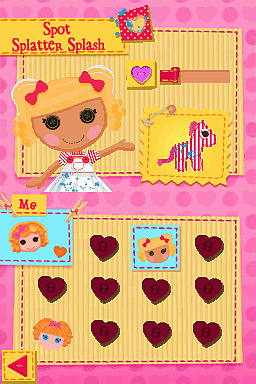 Welcome to the whimsical world of Lalaloopsy on Nintendo DS! 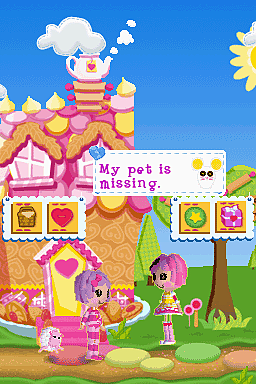 Explore this colorful world and make new friends with the other dolls and their pets! 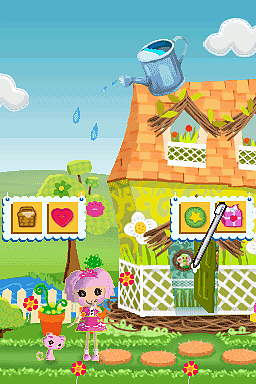 Friends, Silliness and Fun!Make cookies, grow flowers and more, then share with your Lalaloopsy friends! Sew Sweet!Show how much you care for your pets and keep their tummies full with special treats.